Mike Powers at the basket as Vineyard tied Bishop Stang to force overtime. 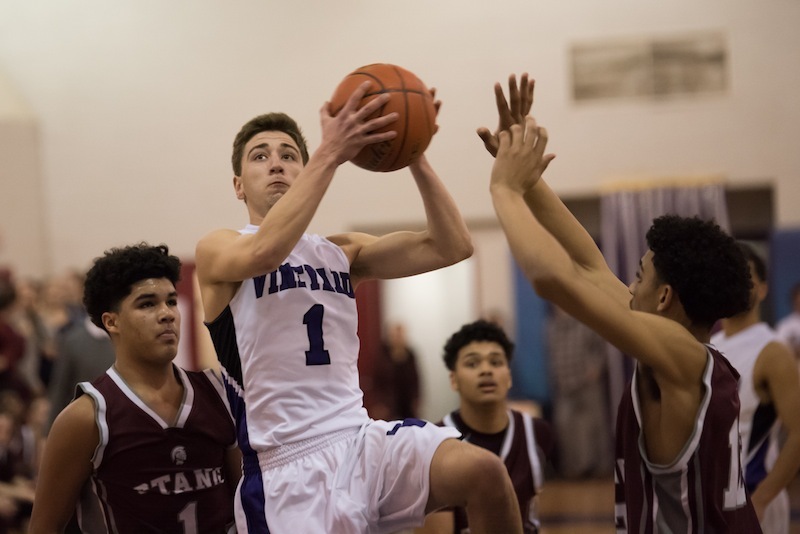 Despite a furious comeback from 11 points down that sent the game into overtime, the Martha’s Vineyard Regional High School boys basketball squad fell to rival Bishop Stang in a playoff thriller at home Friday evening. The 93-87 overtime defeat ends the season for the Vineyarders. Bedeviled early by several traveling calls and fouls in the tightly-called game, the Vineyarders found themselves down by double digits with less than five minutes to go in regulation. 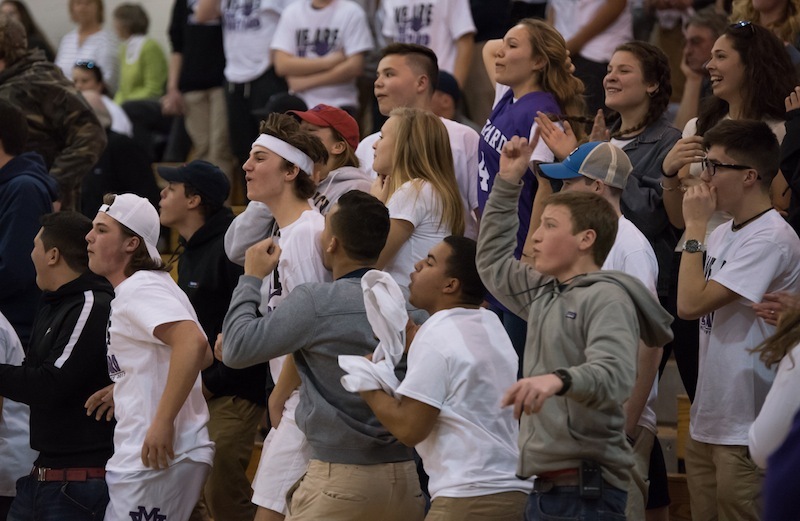 Then came an electrifying rally to tie the game, with the student body rocking Pachico Gym all the way. Stifling half-court defense yielded three steals in the final minutes. The Vineyarders called a time out with 19 seconds to play and the ball in their possession. 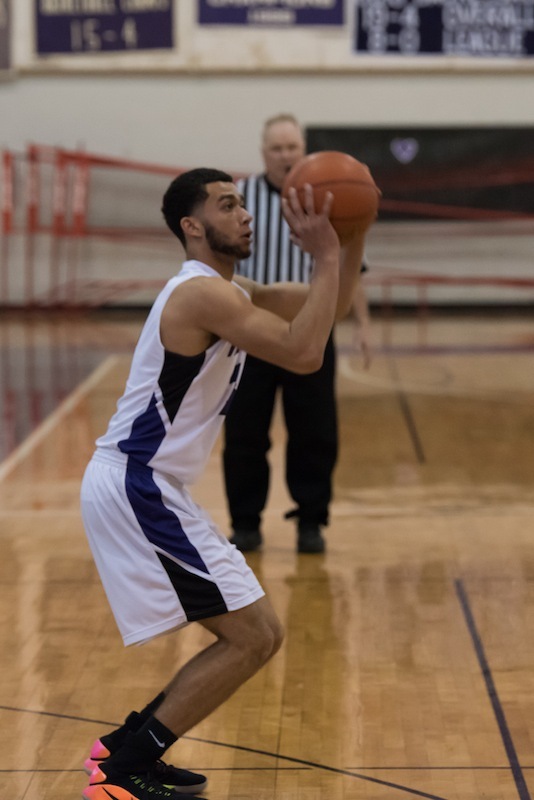 The play they drew up in the huddle worked perfectly when junior guard Ricardo Andrade slipped off a pick and had an open 10-foot shot, but it was just short, and the game went into overtime with the score 72-72 at the end of four quarters. 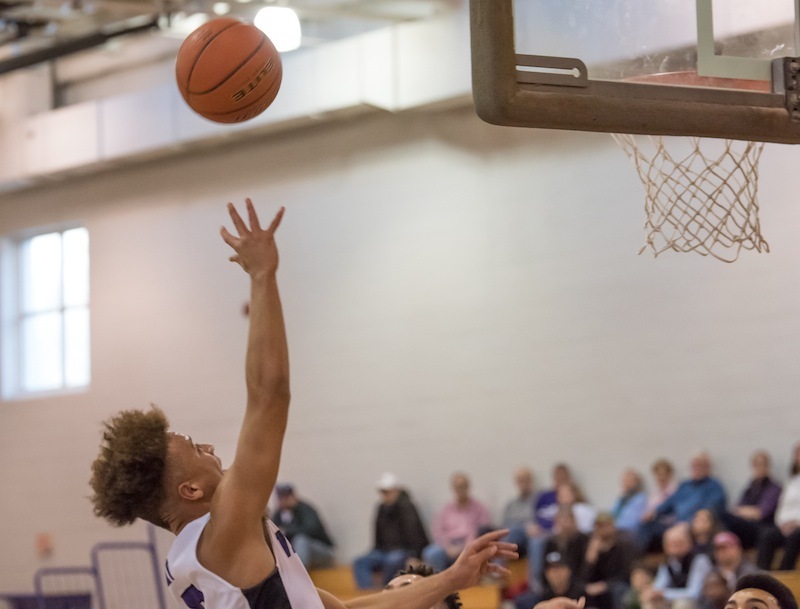 The Vineyard five scored the first basket in overtime, but Bishop Stang started burying three-pointers on the other end of the floor, and prevailed at the end by six points. Nick Bond led Vineyard scorers with 24 points, followed by Andrade with 22 and Dylan Araujo with 18. Dijuan Chummack topped the Spartan squad with 26 points, many from beyond the three-point line, while shooting 14 for 14 from the free throw line. Coach McCarthy thought the playoff match-up was unfortunate. Powers said he found it difficult to be unhappy with the way the close-knit, senior-dominated team played in their last game together. But he also found room for optimism. My son plays for Bishop Stang. I have to agree that it was unfortunate the Vineyard and Stang played so early. They definitely are the 2 best teams in the South. Vineyard played a fantastic game . They almost had the game many times. It was a great game and I wish the Vineyard the best of luck in the future and Good luck to the seniors. Great great sportsmanship!!!! Great group of young men. What a rare and refreshing letter from an off island sports Mom. Her son can be proud of the woman who is raising him for he undoubtedly is in good hands. Much love, respect and well wishes to this family and the Bishop Stang community on the whole. Back in the day, my New York High School sent three out of the five starters on it's varsity basketball team, to the NBA (Gus Williams, Rudy Hackett, and Earl Tatum). But as good as they were on the court, they were even better people when not in the gyms and/or arenas. I have no idea if this Mom's son is destined for professional basketball, but I am pretty damn sure he going to live a fulfilling, rewarding life in our Family of Man. Very nice to hear that Stang Mom. Good luck!